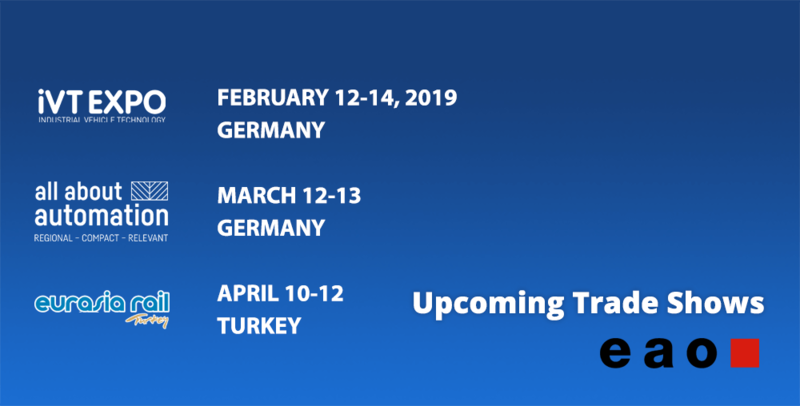 EAO’s Upcoming Trade Fair Schedule » HHP Associates, Inc.
EAO is one of the world’s leading producers of switches, panels, and interface systems. This spring they’ll be showcasing their work at several trade fairs in Europe. First up is the Industrial Vehicle Technology (IVT) Expo in Cologne, Germany, February 12-14. They’ll be at Stand 5040. Registration is free, but conference passes require a fee. Next, EAO will appear at All About Automation fair in Friedrichshaven, March 12-13. EAO will be at booth 410. Tickets are exclusively available on-site, but are free with an exhibitor or partner entry voucher. See their website for more details. April 10-12, EAO will attend the Eurasia Rail Exhibition in Izmir, Turkey (booth/stand information to come). Learn more about visiting from their site.